Please Clean Up After Your Dog It's The Law! 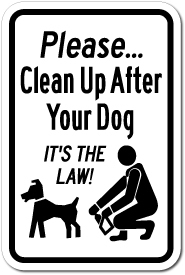 Home > Pet Signs > 18 inch x 12 inch Pet Signs > 18" x 12" Please Clean Up After Your Dog It's The Law! Insuring extended sign life, "Please Clean Up After Your Dog It's The Law!" sign is made of Heavy Duty .080 18" x 12" Aluminum for pole mounting or Standard Duty .040 Sign for fence or wall mounting. All signs come with Standard 3/8" Mounting Holes centered Top and Bottom. Most signs are available in your choice of RED, BLUE, BLACK or GREEN on white background. You also have option to add a reflective background to your sign.